Ford’s decision to cull its sedan range may yet prove to be a rather good one. Sales for its EcoSport crossover have increased by a massive 111 percent in the first quarter of 2019 and according to the Ford Authority website, in what seems to be a bid to keep this momentum going, a range of price-cutting incentives have been introduced on the EcoSport models for the month of April. Up to $4,000 can be cut from a new 2019 EcoSport model made up of a $2,000 customer cash discount, $500 retail bonus customer cash + $500 bonus cash and a $1,000 Competitive Conquest Bonus. That last one is only available to customers who currently own or lease a 1995 or newer Ford, Lincoln or Mercury. The discount is available on all trims from the base S, to the SE, Titanium and top-spec SES. The starting price of the S trim is $21,090 including destination charges which comes down to a seriously attractive $17,090 with all the incentives applied. 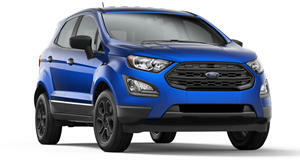 Even if you don’t own an older Ford model you could still drive off in a brand-new EcoSport for $18,090. The savings can also be applied to the better-equipped models and the Titanium Trim, which usually sells for $27,255 including destination charges, now undercuts the lower SE trim by $990 if you qualify for the entire $4,000 discount. The higher Titanium spec means you can get a touchscreen navigation system, leather seats, B&O sound all for nothing and still have nearly $1,000 left over. As always there are a few terms and conditions, customers must take delivery by July 1 and this deal is not available with special finance and lease offers.